• Position two oven racks in the top and bottom thirds of the oven. Preheat the oven to 225ºF. • Put the egg whites in the clean bowl and whip on medium speed until they are foamy and form soft peaks. • To check, turn off the mixer, lift the beaters straight out of the eggs, then turn them upside down. The slope leading to the tip of the egg whites should be soft and barely holding its shape. • With the mixer running on medium, gently shake the sugar over the eggs, letting it blend in slowly. Once all the sugar has been added, turn the mixer to high and continue to beat until the eggs are very fluffy and shiny, and form firm peaks, another 1 to 2 minutes. • Turn off the mixer and check as above — at this point the slope should be nearly vertical. • Put the tip into the pastry bag. Spoon the meringue into the bag until it is half full. Grasp the bag just above the mound of meringue and twist it 3 times (this prevents the mixture from coming out the wrong end of the bag). • Squeeze from the twisted part of the bag, while guiding the bag with a couple of fingers near the tip. Pipe the meringue into any shape you like, such as letters of the alphabet, rounds, or even zigzags. Keep the tip of the bag about an inch from the surface of the pan and let the meringue fall out of the bag onto the pan in a thick rope. • Refill the bag with the remaining meringue. Retwist and continue piping until you have used all the batter. For bones: Pipe the meringue into a stretched version of dog bone treats. For fingers: Pipe a straight line with a knobby center for the knuckle and a tapered end for the fingernail. 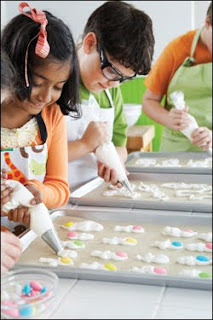 Just before baking, set a colored candy almond or a sliced almond into the meringue at the tapered end. Once the “fingers” have dried, finish them by dipping one of the ends in melted red coating chocolate for blood. Pipe a ring with melted colored coating chocolate, and embellish with colored sugars, dragées, or candy pearls.